Compared to some areas of the world, Britain has a good quality public and private healthcare system – we are lucky that access to high-standard medical facilities are often only a phone call away. That said, it does not mean things are perfect. There are still issues when it comes to patient choice. In certain UK regions, a noticeable difference can be found in surgical outcomes when compared to the results of top London clinics. Northern cities generally have a smaller pool of eye surgeons, and because of this, waiting times may be longer. We believe that in some cases, you should. Surgical operations are often once-in-a-lifetime events, so choosing the nearest clinic could well prove foolhardy. When you want specialised care with expert surgeons, you should not hesitate to travel. London has long been the UK’s hub of eye surgery excellence. With the dawn of laser vision correction, it was no surprise that many top surgeons also decided to locate in the capital. This trend continues today, as is illustrated by the feedback on many online review portals. By browsing the Lasik Eyes website, it can be seen that the vast majority of highly rated laser eye clinics are based in London. This is not a one-off fluke; other websites list the best laser eye surgeons in the country. Again, they are all located in the city. Is it wise to ignore massive amounts of positive patient feedback and opt for the easiest route instead? An example of such expertise is our own clinic. We are the UK leaders in ICL surgery (implantable contact lenses). People with complicated eye prescriptions travel from across the country to see us, simply due to our high-quality reputation. They are no doubt reassured by the fact that one of our own surgeons – Dr Helgeson, has got ICL in his own eyes! 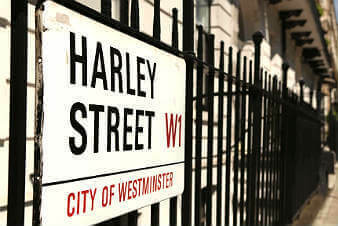 One of the main features of the London medical community is the world-renowned Harley Street. With an unsurpassed reputation for clinical excellence, Harley Street businesses and organisations employ more than 3000 people. At AVC, we are proud to be an integral part of this famous British location, and take our commitment to quality medical care extremely seriously. Visit our clinic and you will find the Alcon surgery suite – the most advanced private cataract theatre in the UK. In addition, our centre director Dr CT Pillai is a leading laser eye surgeon with 25 years of experience, and a fellow of the Royal College of Surgeons. 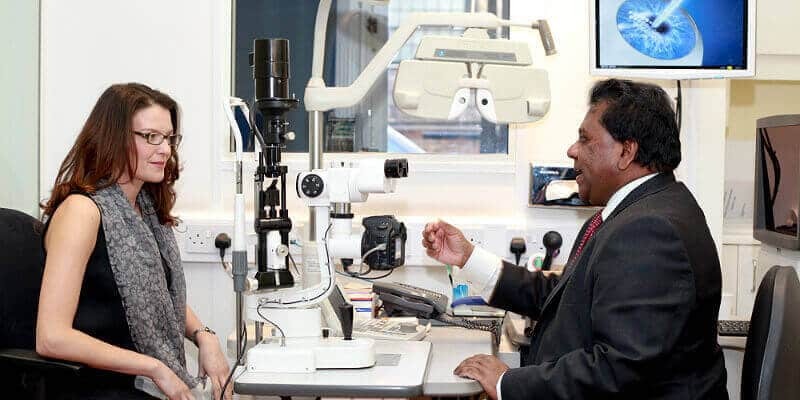 We are also regarded as a specialised centre for Lens Replacement (our trifocal lenses enable you to become glasses-free), and we have the ability to treat rare conditions like Keratoconus – providing visual rehabilitations through crosslinking, kerarings, and ICL. Our clinic regularly welcomes eye experts from the UK and other countries. Delegations from China, India, and beyond have furthered their professional training and knowledge at our Harley Street facilities. Due to its position as the country’s major economic centre, London is blessed with good transport links with the rest of the UK. Day return journeys with other large cities are easily achieved. Leeds, Manchester, and York are a two-hour train journey away, with Sheffield and Birmingham even less. This means overnight hotel accommodation is not always needed. Once in London, it is a very simple commute. Regent’s Park underground station is just a 20 minute journey from Kings Cross, making your visit to our clinic ultra-easy and stress free. Where do you have to attend? Aftercare is a major component of any eye surgery procedure. Dealing with potential issues quickly can make a big difference to your recovery time. In order to make life easier for our customers, we have been busy developing our optometrist network throughout the country, and now have partners in every region of the UK. This reduces the need for further visits to London, while still ensuring you get a superb standard of aftercare treatment closer to your home. Interested in Vision Correction Treatment? If you are interested in scheduling an appointment with our expert team, get in touch today. We often have discount offers for most of our procedures, including laser eye surgery and cataract operations. Our knowledgeable staff can answer any questions you may have, including travel enquiries to our clinic.